GWAP: Professor of computer science Luis von Ahn is getting people to solve problems that computers can't...while they play games. Glubble is an online activity center for families with children under 12. Giving parents and their kids a new way to play, share, discover and learn, Glubble turns the Internet from a personal activity into an experience for the entire family. Glubble ensures a safe environment for kids to enjoy the Internet because parents can pre-approve all the sites their children visit. After all, only parents know what’s best for their kids. New sites can be added at any time… so Glubble grows with your children. Inspiron Mini 12: Dell’s super-slim netbook - MacBook Air Killer ? What's the problem with blogs and social networks? LivingSocial's iPhone Demo from LivingSocial on Vimeo. Could Twitter become the terrorists' newest killer app? Lenovo IdeaPad S10: Best Netbook ? Where is Apple ? The Asus Eee series had better watch its back. Lenovo's about to jump headfirst into the netbook market with not one, but two new devices: the IdeaPad S9, which packs an 8.9-inch screen, and the IdeaPad S10, which packs a 10.1-inch screen. Two configurations of the S10 have been announced in the US. Both have displays running at 1,024x600 pixels, both run Windows XP, and both will use 1.6GHz Intel Atom N270 CPUs. One will get 512MB of RAM and an 80GB hard drive for $399 (£200), while the other gets 1GB of RAM and a 160GB hard drive for $449 (£230). The IdeaPad S9 is also expected to be split across two configurations, though details on those are sketchy. Carcade is a concept for an in-car videogame for the passengers, which captures the landscape and uses it as a videogame environment. Existing objects, for example trees and architecture, are recognized by the camera and enhanced by videogame assets. The game is influenced by the manner of driving of the car. If the driver accelerates, the game becomes increasingly difficult. If the car comes to a stop a different game situation evolves. Turn your iPhone into a netbook ? A company called OLO Computer is working on a small laptop that'll cradle your iPhone and allow you to use it with a large screen and full keyboard. You'll simply pop the iPhone into a space where the trackpad usually sits, turning the iPhone into a trackpad. 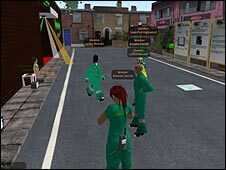 Parallel Kingdom brings new meaning to Role Playing Games by using GPS to place the virtual world on top of the real world. The Social Media Classroom (SMC) is a new project started by Howard Rheingold which offers an open-source Drupal-based web service to teachers and students for the purpose of introducing social media into the classroom. The service includes tools like forums, blogs, wikis, chat, social bookmarking, RSS, microblogging, widgets, video conferencing, and more. The SMC is more than just a collection of new media tools repurposed for educational use, though. The end goal of the service is to move education away from being a unidirectional delivery of knowledge to become a more collaborative learning process. 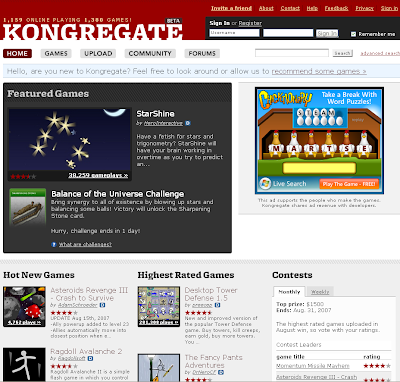 Kongregate Labs: community-supported tutorials for Flash game development. Flash-based indie development community Kongregate has taken the next step in nurturing up and coming game makers. The company said Tuesday that it has launched Kongregate Labs, a new branch of the site's community that offers community-supported tutorials for Flash game development.